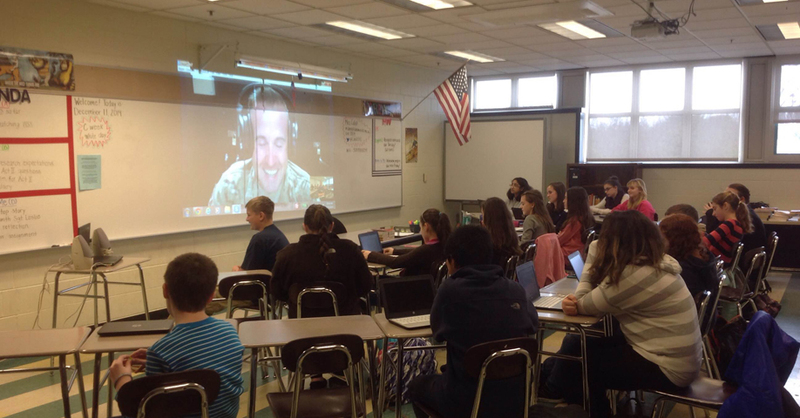 Thursday, December 11 was a very exciting day for my STEM Academy “News To Me” Elective students, for we had the opportunity to Skype with a USAF photojournalist stationed in Africa! When Maggie Mahoney’s article was published in the paper, her mother shared it with their extended family. Her sister-in-law then forwarded it along to her brother, a Sergeant and photojournalist in the United States Air Force. Maggie’s article was an editorial about paying military personnel more than professional athletes. His troop, stationed in Djibouti, Africa, sent Maggie an official certificate of appreciation and acknowledgement. Sergeant Carlin Leslie reached out to me after reading the article when he learned about the nature of the class. Because he serves as a photojournalist for the Air Force, he connected with the news/journalism aspect of the course. We had a few exchanges about what the course is all about, and eventually decided to set up a day to Skype! On Thursday, December 11 in class, we video conferenced with Sgt. Leslie from about 10:00 – 10:55, and that was only because class ended at 11:00! The kids asked questions they had prepared ahead of time about both his career in the Air Force and his experiences in photojournalism. They had a blast and it was extremely insightful! The students enjoyed learning and connecting with others that day.